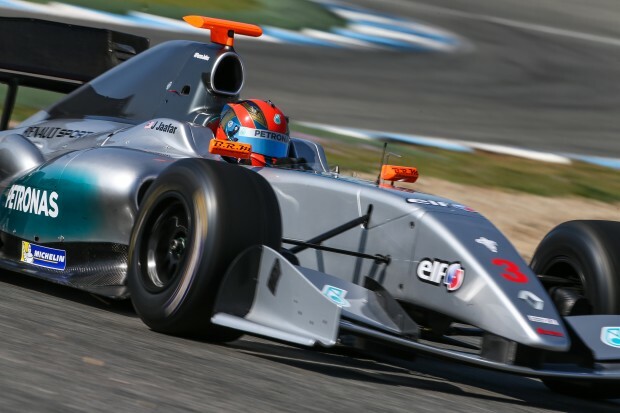 Jazeman put in a strong performance in the opening test session of 2015 for the FR3.5 Series, finishing fourth quickest on the first day and fifth fastest on the second day at Jerez circuit in Spain. The first day of the test was interrupted by frequent red flags, with a total of 13 stoppages by the end of the day. Despite these hampering the flow of the sessions Jazeman was able to show his mastery of the Jerez track with strong lap times. The young Malaysian quickly gelled with the Fortec team and was able to work through a comprehensive programme in preparation for the new season. On the second day of testing the low-downforce aerodynamic configuration over the rear wing was mandatory for all the teams and drivers. Jazeman continued his preparation for the 2015 season with the regulations that will be in effect during Saturday qualifying and race one. Jazeman said of the day, “It was a very productive day running in low downforce set up. It wasn’t new to me as I’ve used this set up on some of the tracks last season. I’m pleased that we continued our strong pace through to the second day and showed that we’re title contenders at this early stage”. The next pre-season official test is 30th – 31st March in Motorland, Aragon.